Short Information : Central Industrial Security Force (CISF) Are Invited Online Application Form for the For the Constable and Fire Constable Vacancy Under Recruitment 2018 Those Intermediate Level Candidates Are Interested to the Following Form and Completed the All Eligibility Criteria Can Read the Full Notification and Apply Online. The Central Industrial Security Force (CISF) has announced the exam date of the DV Test which will be held for the selection of Constable Fire in CISF for 332 empty positions. Earlier the Written Exam were conducted and the candidates who qualified the Written Exam were called for the written examination. The written exam were taken place on 15-July-2018 at various exam centers in India. The candidates, who have qualified for the written exam, have to download the Admit Card issued in their name in order to attend the written exam. The CISF Constable Fire DV Test Admit Card 2018 has released by CISF today. Candidates will be required to sign in with their Registration Number and Password generated at the time of online application to download the soft copy of the Constable Fire DV Test Admit Card 2018. After downloading the Constable Fire DV Test Admit Card 2018, candidates have to print out of the admit card and must carry it along with an original photo id proof at the day of examination. The candidates who will qualify the written exam will be considered for the final merit list. 4. After submitting the details, candidates will be able to view and download the admit card. Conclusion : For more detailed info regarding to CISF Constable Fire DV Test Admit Card 2018 kindly visit official website and read carefully employment advertisement before applying . 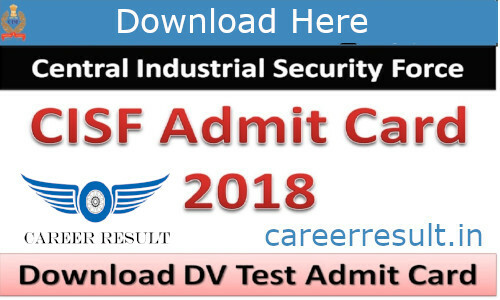 Subscribe Careerresult to get latest updates about CISF Constable Fire DV Test Admit Card 2018 on your smartphone via E-mail. For more latest jobs updates in Defence Jobs Stay connected with us.All candidates have to request is to share this job link with your friends over at Whats App, Facebook ,Twitter,Instagram and help them get good career in your life.